?and?Geordan Hankinson, co-presidents of the Net Impact Segal Chapter for the 2013 school year, recently had the great opportunity to travel to Baltimore to participate in the 2012 Net Impact Conference. I have always been fascinated by the intersection of business with the complex social and environmental issues that confront our cities and countries. 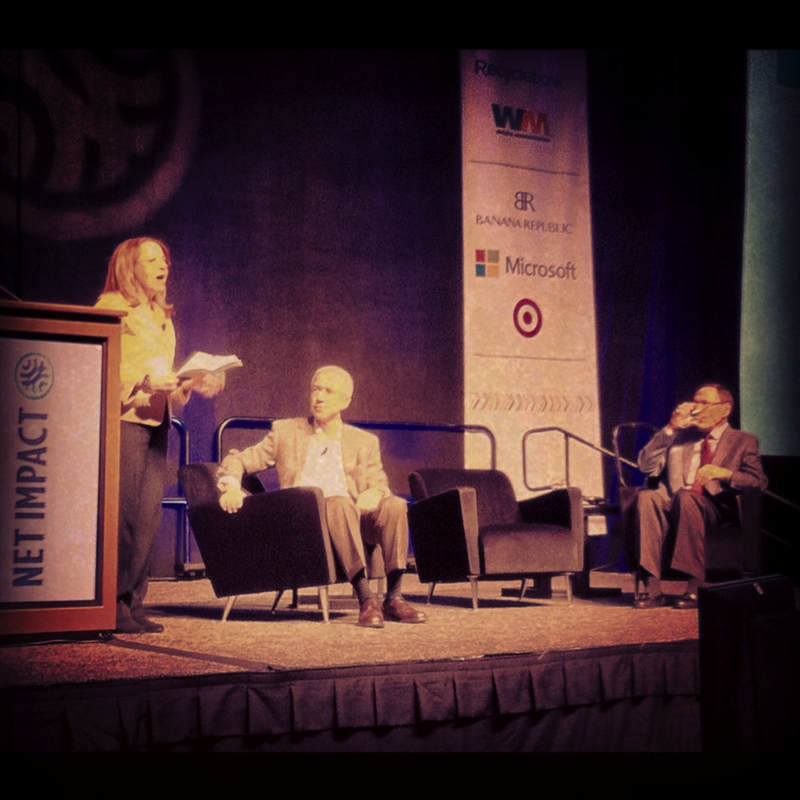 The Net Impact Conference brought together many bright minds who are using innovative business models to address some of the most difficult problems confronting our societies. Joaquin Duato of Johnson & Johnson, and Kurt Kehne of UPS during the Saturday keynote session. What I enjoyed the most about my experience at the conference was the opportunity to engage with professionals who are profoundly solutions oriented. Net Impact brings together people from a range of backgrounds who have spent a good part of their lives not just identifying and talking about problems that need to be solved, but actually trying to solve them. As attendees at the conference, Joanna and I had the opportunity to hear a wide array of such creative minds in the various workshop and speaker sessions held throughout the weekend. My favourite of these sessions was one entitled the Five Levers of Social Change facilitated by Aaron Hurst. Aaron is the president and founder of the TapRoot Foundation, an organization that connects business and legal professionals (offering their services pro bono) with small not-for-profits who are serving their communities or protecting the environment in innovative ways. Aaron has written extensively about the most effective ways to move the dial on any particular issue (be it social, environmental or economic) and he has distilled this into what he dubs the Five Levers Framework (for more detail w88Việt nam read his excellent series on the Stanford Social Innovation Review). For his workshop, he brought together business professionals from a variety of organizations and firms who are applying each of the five levers in a unique way. In the mix were Lisa Nitze, managing director at Mission Measurement, whose firm uses data and statistical analysis to help nonprofits better deliver on their missions. Robert Kaplan, Senior Manager of Sustainability at Walmart, spoke to us about the ways that Walmart was using policy tools to reduce carbon emissions from its supply chain. Aaron Schiller spoke to us about the way his organization, Causes.com utilizes disruptive technology to change the way that people raise awareness of global issues, and ultimately impact public perception of a given issue. Though the five individuals that spoke were all from unrelated organizations and were all actively involved in effecting change through applying one or two specific “change levers”, the workshop did a great job showing us ways that all five of these levers could be applied to effecting lasting change whether the issue is environmental stewardship, education reform, or more effective impact measurement. It was also a unique look at the ways in which non-profits and for-profit businesses can partner to achieve common goals by sharing strategy, and complementing each other’s skillsets. In addition to this workshop, I was able to attend many learning sessions on impact investing, and business ventures in developing markets, all of which I found immensely valuable. Aside from these excellent workshops, we had the opportunity to meet many other chapter leaders from different schools across North America, and interact with other students each trying to find creative ways to apply the business skillset to solve complex issues. We are both excited to take our experiences and lessons from the conference and share them with our own chapter here at Segal.